I have had a lot of people asking me WHAT IS A MICRO MINI DONKEY!!!!!!! 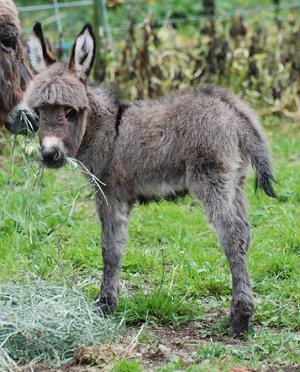 A Micro mini is a miniature donkey that measures 30" and under. And it is preferred that there sire and dams are under 30" also. Don't be fooled by a jennets first foals being small in size. They will mature regular size and or throw normal sized offspring. Normally if you take the sire and dams heights and pick the size in the middle that is the size there offspring will mature at. Give or take. My Micro herd sire is 26" when you breed him to a 30" jennet his foals will mature 28". There are many breeders of Miniature donkeys that are having trouble selling there donkeys so they have started promoting there's as Micro Mini's. Everyone is looking for the Micro Mini's for therapy, pet's for the elderly or just a great family pet. We are the only serious Micro Mini breeder west of Minnesota/Texas breeding the true quality Micro Mini donkey. Please Check out our Farm News page and What We Do With Our donkeys. For the latest farm happenings. Check out our online donkey Store. Just go to AssEnd Trading (located to the left)and you will find all of our donkey related items. For both the human and the four legged ones. Imagine The perfect pet......... Imagine the Miniature Donkey. From the first moment this appealing, long eared foal hits the ground, it's mission in life is to give you love and thrive on attention. They are without a doubt the most adorable, affectionate, soft and cuddly creatures in the animal kingdom. Totally trustworthy around children, elderly and the handicapped. Miniature donkeys(when mature), are easily trained to pull carts/pack and be ridden by small children. They companionable with other livestock and become quite attached to their herd mates, as well as their owners. Miniature Donkeys are very popular because so many people realize and value their unique qualities; they are also a good financial investment... an investment you can love! Lords Hill Farm was established in 1968 here on the banks of the Snohomish River. We take pride in all of the animals raised here on the farm. We have had many champions in Pygmy goats/Llamas/Horses/and of course Miniature Donkeys. We spend a lot of time with our donkeys and each and every one of them are special to us. They are part of the family and are treated as such. We think of our donkeys as lap donkeys. Because that is what they are. When I take people out into the field to visit they are all over them. We do not have to give our donkeys treats to come over and visit, it is bred into them. We do rescue donkeys and place them into great homes. Our herd consists of 50+ jennies picked or bred from Top Quality bloodline from the US & Canada. All of our jennies range from 27" to 32"(we do have a couple of gramma's that are 33"-34" that will never leave)in a large range of colors. We have all shades of: grays-blacks-browns-sorrels-and a few spotted ones). We also have nice woolly ones. We breed for conformation-soundness-temperment- easy of foaling and to top that all off we also want our donkeys to have beautiful heads and ears. Little Red Man is a 31" dark sorrel. Multi champion in both halter and performance. He has also won many Hi-Point awards. He is what you breed for. His temperament is the best one that I have ever come across for a breeding jack. He is loved by many. All the judges say that he is the best tempered hack that they have ever seen. We call him our little everready bunny. He just goes and goes. Never complains. Lords Hill Bold Edge (Mr. BE) is a 27.5", Dark red jack. He also has a great temperament. He has heavy bone and great width through out. And is a real sweet heart. He is a son of our multi champiom in halter and performance, Little Red Man. His first foals will be hitting the ground in 2019. Mr. Pips Queak is a 26" Black. He was only 18" @ birth and has remained small. All thought he is tiny he still carries substance and a big adorable personality, he just wants to be in your pocket. His pedigree goes back to the great Dandy herd. Pip has sired some super tiny foals and is what they call a micro mini donkey. I look forward to having Pip for a long time and adding his genetics into the breeding herd. MGF Absolut he is a 31" black & white. I was sooooo very happy to win the bid on this beautiful wooly jack. Absolut has been the Mc Roberts number one wooly breeding jack for some time. For me to be able to bring him home what a pleasure. But even more to add him to my wooly breeding program wow. He has perfect conformation and the most beautiful wool that anyone has seen. I look forward to seeing what he can do for my wooly breeding program. If you are looking for a great sire to breed your jennet to look no further. We do stand our jacks to outside Jennet's. They are both US & Canadian registered. Do not pull without asking first, and then wait for a response? Do I grab when I should be holding my “dance partner’s hand” gentle with the right amount of firmness so my equine may follow my leadership? Do I mindlessly handle my equine with little or no thought of how he would like to be handled? Do I need to dominate my equine with a heavy hand to show him who is boss? Light Equine – When our equine can depend on us to have enough knowledge to know when to, how to, and why, he will be able to relax and count on us for our leadership. When he is relaxed and feels he is being understood, he will be able to move with grace and rhythm. “You will move together like a flock of birds. In the sky – you will be in sync. Old habits die hard. However, if you seek a light response, a light equine will emerge from the dust of the arena! � Animals to be in good physical condition whether to be sold as pet or as breeding stock. � To be provided health and breeding history with full disclosure of any pertinent information the owner should be aware of. � Animals to be behaviorally sound, living in a herd and not weaned earlier the 4-6 months of age. � Registration certificate, signed transfer, and pedigree records current with the registry of choice. � Any sales guarantees should be spelled out and signed. � Breeding stock that represents the guidelines outlined in the NMDA�s Miniature Mediterranean Donkey Breed Standard. � Information about the Breed with care, diet and other necessary information provided. � The newly purchased donkey to be current on vaccinations, worming and hoof trimming. This information should be in writing with dates and types of vaccines. � A properly fitted halter and lead included in the sale. Buyers should seek out breeders who adhere to the above principles and thereby demonstrate their responsibilities to both the buyer and the Breed. This information is reprinted courtesy of the National Miniature Donkey Association (NMDA). We would be happy to answer any questions that you may have on the animals that we raise. Our counter was started on September 11, 2007.